The Canadian Driver's Daily Log Book 763-LD is a Carbonless 2-Ply English/French log book with Simplified Recap and Detailed DVIR. Upper half is Canadian log form with 24-hour grid and Daily Recap. 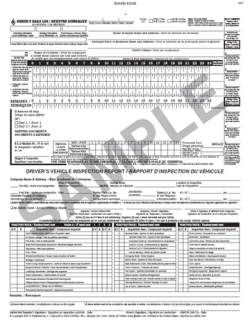 Lower half is a detailed Driver's Vehicle Inspection Report that meets Canada's National safety code truck inspection requirements specifications. 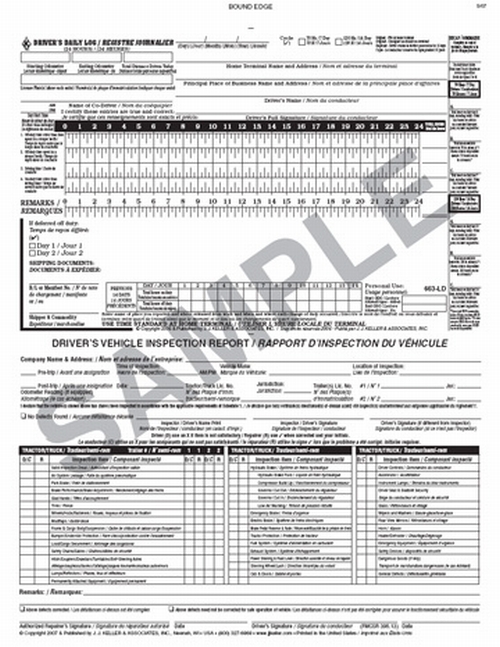 This format helps drivers properly record daily log information as required for Canada's Commercial Vehicle Drivers Hours of Service Regulations effective January 1, 2007. This log book is useful for Canadian extra-provincial carriers and U.S. carriers operating in Canada. On January 1, 2007, the new Canadian Commercial Vehicle Driver's Hours of Service Regulations issued under the MVTA became effective.